Portsmouth fans celebrate a goal in the Checkatrade Trophy FInal at Wembley. Watching 85,000 fans descend on Wembley Stadium last weekend for a game between two League One clubs summed up how tough promotion to the Championship can be for clubs like Peterborough United. Sunderland and Portsmouth fans packed out Wembley for something as trivial as the Checkatrade Trophy Final before resuming their fight for promtion from League One. Posh owner Darragh MacAnthony (left) with Barry Fry. Incidentally the doom and gloom merchants who bother me on a regular basis with claims of no-one renewing season tickets for 2019-20 have again been proven, by increased sales figures, to be speaking only for themselves. Posh regularly punch above their financial fighting weight merely by threatening to reach the play-offs. The five teams certain to finish above them this season are better resourced helped by much bigger crowds. That might change in the future even if a 10-year plan to reach the Premier League is beyond ambitious. Posh have already been given a boost for next season by a lucrative sponsorship deal with a home building company and if only a fraction of the thousands of children who have taken up the offer of free tickets this season return on a regular basis crowds could rise again. I look at the goings-on at Bolton Wanderers and thank the lord for Darragh MacAnthony’s stewardship. I also look at the plight of Scunthorpe, a club who gambled big on promotion from League One for a couple of season with a budget out of all proportion with the size of their fanbase, this season and I wonder if that sort of financial risk can ever be justified. 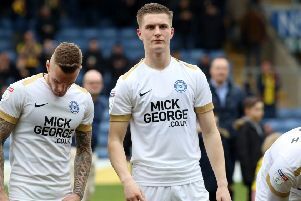 Of course I’d love Posh to go up to the Championship again, but I want them to be ready on and off the pitch and that isn’t the case right now. One major benefit of promotion would be escaping the Football League Trophy. It was a great day out when Posh won it in 2014. Not caring too much about the result helped. But don’t let one massive crowd fool you into thinking it’s worth the hassle of poorly-attended group games and a library atmosphere at knockout matches. Pompey played weakened teams all the way up to the semi-final. For six months they were as interested in blooding young players as they were in winning silverware. Even their marvellous fans were apathetic. Only 2,000 of them turned up for an effective quarter-final game against Posh at Fratton Park. Those extra matches could yet prove a huge hurdle on the road to the ultimate aim of promotion. Losers Sunderland have eight League One matches in April. Even with the luxury of Premier League parachute payments they are far from certain to go up and that would be rather embarrassing for a club of their size.